Legends claims that the stars may be found in the depths of a woman's eyes. Velvet Lash eyelash extensions in Alpharetta, GA has brought this wondrous idea into a reality. Delve into a world of mystery and intrigue that will turn heads when you walk into a room with Velvet Lash's luxury eyelash extension salons near me. Velvet Lash is committed beautiful lashes that are personalized to your every desire. Discover the best eyelash extensions near Alpharetta, GA with Velvet Lash. In a world where it's normal to blend in with a crowd, be bold enough to stand out. Are you new to the eyelash extensions? Now's the time to jump in on the action! 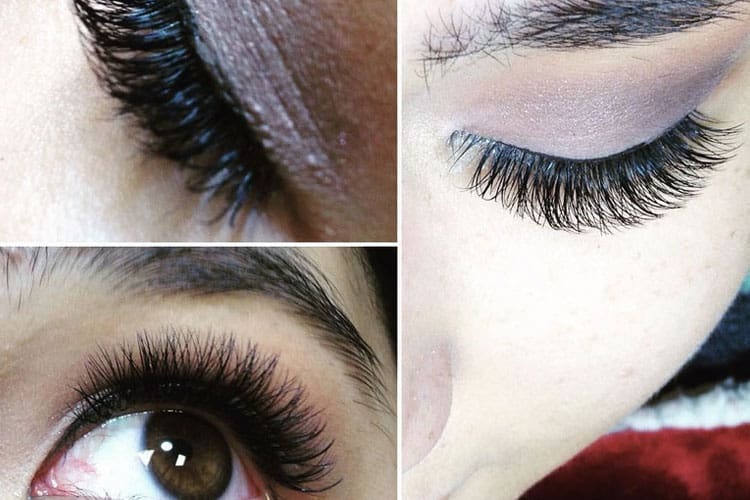 Here are some recommended services if you want to test out eyelash extensions lifestyle. We're excited to see you're interested in Velvet Lash. Re-lashing has been made simple and easy with Velvet Lash. Here are some recommended services if you want to Velvet Lash. Do you have any questions or concerns about sensitive eyes? Do you need help to determine if eyelash extensions look is right for you? Our professional certified stylists are more than happy to help. Call us at 470-839-5597 for free consultation or book online. Individual eyelash extensions application process could be long up to 2 hours. At Velvet Lash we try to make our clients relax and comfortable as much as possible. Most ladies felt asleep during the process. Eyelash extensions salons near me could get pricey. We recommend our clients to stay away from cheap eyelash extensions salon. Most likely they are not certified, not using correct adhesive and incorrect extensions that could damaging your natural lash. Without proper allergy testing, eyelash extensions adhesive may cause reactions that are unintended and could lead to discomfort. That’s why Velvet Lash recommends Allergy Testing pre-application if you are new eyelash extension salons near me. Say goodbye to that messy mascara. Achieve gorgeous lashes that range from a natural and subtly sweet look to a bold and jaw-dropping appearance. You can rock your lashes any way you like—it's all up to you. Easy maintenance is a perfect example of how wonderful individual eyelash extensions can be. You get to become the center of attention without any messy lash glue or mascara—your lashes are simply yours! Your stunning eyes will immediately become a conversation starter when you show of your low-maintenance full lashes. Vivian is easily the best eyelash extensions in Alpharetta, GA. My lashes look great every time, even when I go in to get a refill. She takes her time, is clean and very very thorough. Their studio is so calming and relaxing. I absolutely love going there! I would recommend her to anyone out there looking for a set of eyelashes that will blow you away! I had my first set of eyelash extensions in Alpharetta GA put on two days ago with Mia at Velvet lash and my experience here has been superb! As a newbie, I had lots of questions and the owner Vivian was quick to respond by text to answer them in advance. I decided on a volume set on my first go for the drama as a frequent wearer of false strip lashes, the look turned out perfectly! Excellent service! Jill is a true professional. She always makes sure I am happy before I leave. She knows exactly what I want and never disappoints. I walked in with a poor lash job from only 1 week ago. Mai fixed the botched job and made me a new customer in less than an hour!!! I can not wait for my next visit with her. In general, eyelash extension pricing ranges from about $195-$300 for a Classic full set and $300-$450 for Volume full set. Velvet Lash provides both the best of quality products along with a great selection to choose from so that everything you desire falls right within your price range. We highly recommend our clients to stay away from cheap eyelash extensions salon that charge below $120 for full set. Those stylists normally are not certified, not using correct technique and applying low quality adhesive that could damaging your natural lash. We have numerous of clients coming to our salon for removal because they chose cheap eyelash extensions. At Velvet Lash, your health and satisfaction is our top priority. We also offer free consultation to understand the look you want to achieve. With proper care, your eyelash extensions will last as long as the natural ones that you already possess (roughly 8-12 weeks). In order to maintain this special care, we recommend that you come back for a touch up every 2 to 4 weeks to ensure that you’re getting the most out of your set. Are eyelash extensions bad for your natural lashes? In order to keep your natural lashes healthy and strong, it’s important to get regularly touch up, follow our after care instruction (daily cleansing routine), and go with the length and thickness that your stylist recommend you. There are certain concerns that may occur after an allergic reaction to the lash extensions themselves. Velvet Lash recommends an Allergy Test to determine if our bold and beautiful lashes are fit for you! How to become licensed eyelash extensions technician? Master Cosmetologist. The key to working so well with beauty products like eyelash extensions is the complete understanding of the field itself. Master Cosmetologists must graduate with a high school diploma/GED, complete eyelash extensions training course, possess a cosmetology license, and complete at least one year of work experience. Esthetician. An Esthetician is a person who specializes in the cosmetic properties of the skin. An Esthetician becomes certified after receiving a degree in skin care, a license in the field, and achieving more experience in this direct line of work. Velvet Lash is happy to provide 3 looks to choose from: Classic, Volume, and Mega Volume. Each of these styles possesses their own qualities and features that make them a must-have. Whichever lash look you’d like is completely up to you! Contact our professional certified stylist for a free consultation to determine which look best fits your style or special event. How often should I come back for re-fill? We want to be sure that your gorgeous eyelash extensions are in great shape for every day. We recommend a touch up once every 2 weeks to ensure that every lash is in place and that you’re picture perfect anywhere you go. Can I remove eyelash extensions? To avoid complications and unnecessary strife, we do not recommend that you remove your eyelash extensions on your own. Instead, you could allow the extensions to grow out on their own or come in so that we can professionally remove them for you. Can I wear mascara eyelash extensions? As long as you’re using mascara that’s fit for eyelash extensions in Alpharetta ga, go for it! Be sure not to use waterproof mascara. Can I curl eyelash extensions? With the natural shape of our eyelash extensions in Alpharetta, GA there’s no need for curling on your own. Attempting to curl these lashes yourself may lead to eyelash extensions being pulled out unnecessarily. Alpharetta GA is small town with great community and tons of things to see and do. Velvet Lash is thrill to be part of this great community and will continue to be the best eyelash extensions salon near me. Here are some restaurants and things near Alpharetta GA.